Chinese trading of imported iron ore cooled down over the past week, in marked contrast to the frenzy of business over the previous week in response to the emergency production curbs on steelmakers across much of northern China. The ebbing of activity further undermined imported iron ore prices. Over March 4-8, the daily trading volume of imported iron ore inventories at major Chinese ports reversed down by 211,000 tonnes/day on week to 817,000 t/d on average. At the same time, the daily trading volume of seaborne cargoes plummeted by more than half, dropping by 167,000 t/d on week to 155,000 t/d on average. Last Friday, Mysteel’s price index for 62% Australian fines seaborne cargoes lost more ground, dipping by $1.25/dmt on week to $85.4/dmt CFR Qingdao. In parallel, Mysteel’s port inventories price index for the 62% Australian fines, easing by Yuan 11/wmt ($1.6/wmt) on week Yuan 628/wmt FOT Qingdao and including 16% VAT. Rio Tinto (NYSE: RIO), a leading global mining player and one of the largest iron ore miners in the world, is set to announce its FY 2018 results on February 27, 2019, followed by a conference call with analysts. The company is expected to report net revenue of $40.7 billion in 2018, 1.6% higher than $40 billion in 2017. Higher revenue would most likely be driven by increased output and higher prices of iron ore and aluminum, offset by the loss of revenue from the sale of coal assets. Earnings for the year are expected to be $5.14 per share, compared to $4.90 per share in 2017. The higher EPS is likely to be the result of gains from the sale of low-margin coal assets, lower finance cost due to a bond buyback program, and higher capitalized interest, slightly offset by higher exploration and evaluation costs. 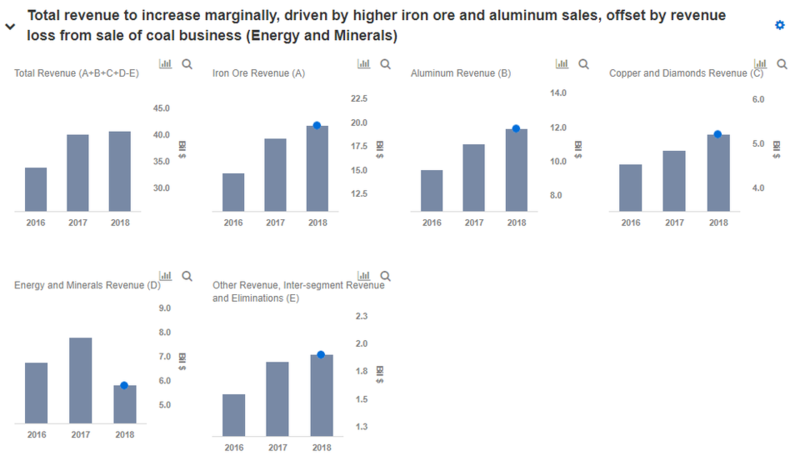 Our expectations for Rio Tinto’s FY 2018 results and projection for the company’s key drivers that impact its price estimate are available in our interactive dashboard – Would Rising Prices And Output Of Iron Ore Help Rio Tinto Offset Loss Of Revenue From Coal Segment In 2018? In addition, here is more Materials data. 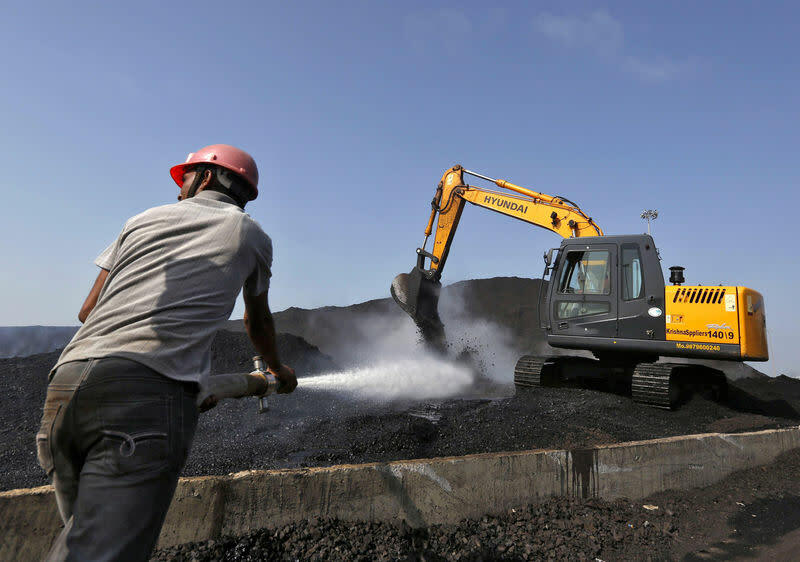 NEW DELHI (Reuters) – India’s thermal coal imports could rise by about 10 percent in 2019 due to rail transport problems and other logistical bottlenecks, an executive at the country’s largest coal trader Adani Enterprises said on Tuesday. Thermal coal imports rose in 2018 after two years of decline, despite moves by Prime Minister Narendra Modi’s government to cut the country’s imports in a bid to reduce the trade deficit. Rajendra Singh, chief operating officer for coal trading at Adani Enterprises, said thermal coal imports this year could total 174 million-177 million tonnes. “We expect a 10 percent increase in imported coal because of an immediate gap in supply from Coal India and power demand and demand from other sectors,” Singh said at the Coaltrans conference. The reduction in exports is not due to operational issues at the terminal but reflects weaker global demand, CEO Alan Waller says. 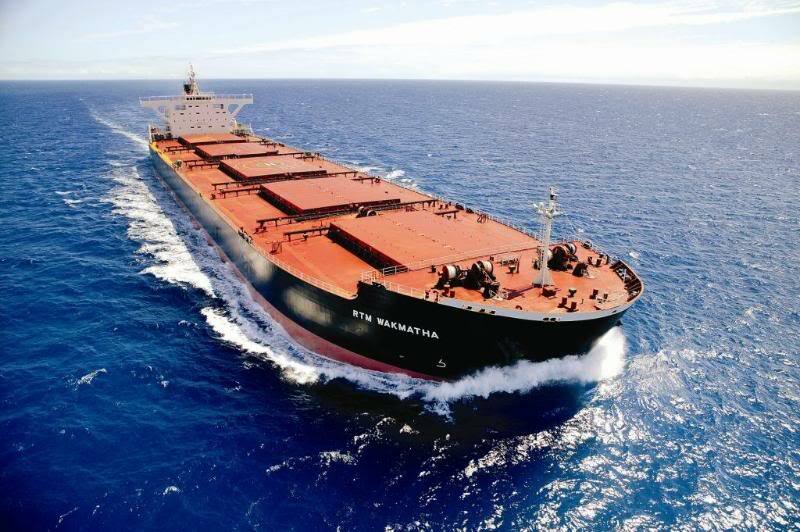 Three-million fewer tonnes of coal were exported from the Richard’s Bay Coal Terminal (RBCT) in 2018 as global demand for South African product weakened in response to high prices. In a briefing on the annual performance for 2018 on Thursday, RBCT reported coal exports of 73.47-million tonnes for 2018 —4% less than the 76.47-million tonnes exported in 2017 and falling short of a previously-stated target of 77-million tonnes. On average the terminal received 26 trains a day in 2018 compared with 27 a day in 2017. The reduction in exports is not because of any operational issues at the terminal but, rather, is a reflection of weaker global demand, said CEO Alan Waller. “Whatever has been railed has been shipped. [The reason for lower exports] is global demand; it’s market dynamics,” he said. Xavier Prévost, senior coal analyst at XMP Consulting, said the weaker demand was because South African coal index prices had been marginally higher than those of other coal producing countries such as Colombia and Australia in 2018. The Richard’s Bay terminal, which is owned by 14 major coal-mining companies, is one of the largest such facilities in the world and has an export capacity of 91-million tonnes. Coal exports are a significant foreign-currency earner for SA. Nearly 82% of the coal leaving RBCT was delivered to Asia in 2018, with India being the largest market. Africa received 8% of the export coal and Europe procured 10.1%. 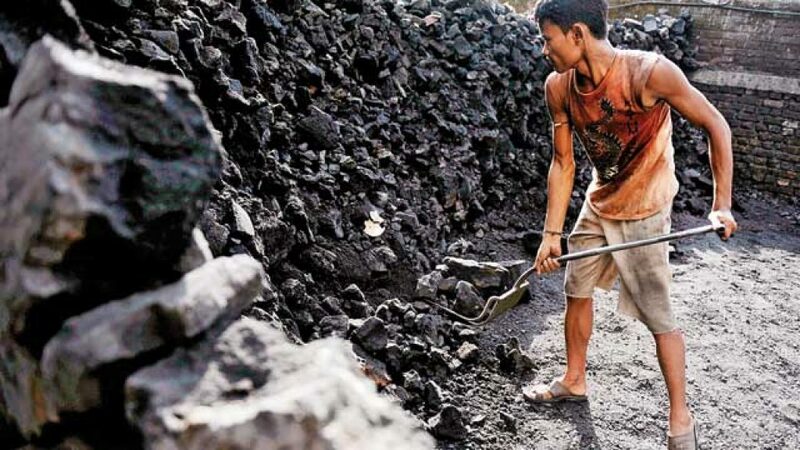 NEW DELHI, July 24 (Reuters) – India’s thermal coal imports rose by more than 14 percent in the second quarter of 2018 from a year earlier, putting the energy-hungry nation on track for a rise in annual imports after two straight years of decline. Indian imports rose to 43.4 million tonnes during the three months ended June 30, up from 37.9 million a year ago, according to data from American Fuels & Natural Resources, a Dubai-based trader of coal from the United States which tracks shipments around the region. That is India’s highest quarterly import tally in two years, which along with higher consumption in China has been a major driver behind the strong recovery seen in benchmark Australian coal prices this year. The strong purchases take India’s first-half imports to 81.9 million tonnes, up 13 percent from the 72.3 million tonnes imported over the same period in 2017. Domestic logistical bottlenecks due to a shortage of trains, regulatory changes targeting pollution cuts and surging power demand have all fuelled the higher imports, which are expected to stay firm through the rest of the year. “Users of petcoke switching over to coal due to a ban in some regions, regulations being contemplated in others, and logistical bottlenecks are driving coal demand in India,” Vasudev Pamnani, a senior coal trader from American Fuels, told Reuters. Indonesia accounted for over three-fifths of total supplies during the latest quarter, while South Africa accounted for over a fifth, according to vessel arrival data tracked by American Fuels. That road map comes ahead of a busy period. The U.S.-China trade fight will be in focus this week, with a U.S. delegation in Beijing for talks from Monday. In addition, there’ll be more pointers on the macroeconomic outlook, with the World Bank updating its Global Economic Prospects report on Tuesday and a speech from Federal Reserve Chairman Jerome Powell on Thursday. Investors will also be tracking the U.S. government shutdown as disruption drags on. As a final shout-out, two emerging-market hot spots need highlighting. The Democratic Republic of Congo just delayed the release of provisional results from the presidential election as criticism of the vote mounts in the metals powerhouse. And Venezuela’s Nicolas Maduro is due to be sworn in for a second term as president on Thursday, drawing fire from critics at home and abroad, and raising fresh questions about the nation’s ability to keep pumping oil. The standout feature in commodity markets last quarter was crude’s swoon from four-year high into a bear market. 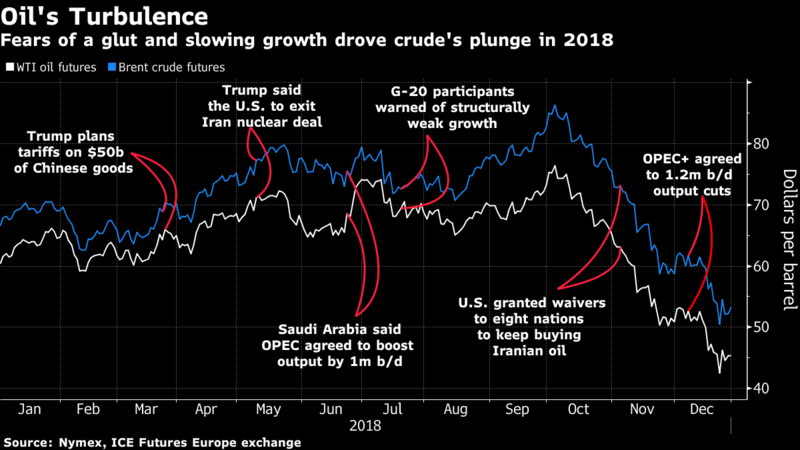 The drivers of the reversal were record U.S. shale output, a clutch of sanctions waivers on Iranian flows, and a supply cut from OPEC+ deemed by some as too little. Concern about a deteriorating global economic outlook gave bears further ammunition. After that drama, prices may recover, with supply risks underappreciated.